Since winning Telstra Road to Discovery a handful of years ago, Jasmine Rae has been a feature of the Australian country music scene. If she’s not releasing an album she’s touring, either her own show or with others. Sometimes she’s working on an album while meeting those tour commitments. Over the course of her four albums she has matured to become a strong musical force. She’s an artist who has a clear idea of her sound and what she wants her music to say. 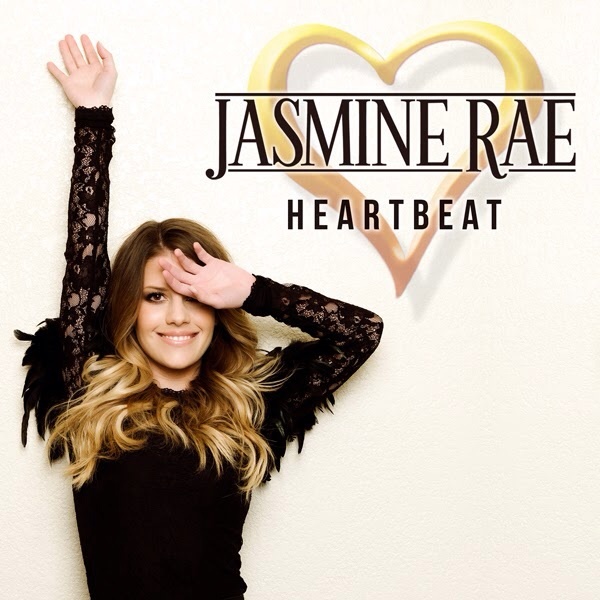 Recently I spoke to Jasmine about her new album, Heartbeat. Congratulations on another fantastic album – you just keep getting better and better. Oh, thank you. It’s very exciting having new music out. It feels like a little child is about to take its first steps. It’s nerves but the kind of nerves … Well, you hope people like it. The album’s already made now so if they don’t like it you can’t unmake the album. So fingers crossed and you do everything that you can to have as many people hear it as they can so they can their mind up and hopefully like it. It is scary but it’s more exciting now, I think, that it’s my fourth one – I’m kind of used to it. I remember seeing you performing on Peel Street at the Telstra Road to Discovery and that doesn’t seem that long ago, really. Thank you – I’m glad you say that, because it was 2008. But it only seems like three or four years ago, and therefore it seems like you’ve had a lot of albums out in a short period of time. Well, four albums and I had a little Christmas EP as well – I haven’t really had any time away from music. Music has been my whole life since then. So ever since 2008 when I won that competition my whole life changed and I’m still on that ride. Your sound is evolving, and it’s always great when an artist does that because it means you didn’t think you’d just repeat whatever worked for the first album. In life terms, I know that before your last album your father died and that would still obviously have an impact on you, but I wonder what the rest of your life has been like in the last two years, because your album sounds more sophisticated – and obviously you’re growing up, so it would – but there’s a different sound to it, if that makes sense. I moved house in between – I’m now living in Sydney, I was living in Melbourne. I’m still kind of going through the grieving process with my dad passing – it’s coming up to three years now. You kind of find a new confidence in yourself, dealing with things without running it by him the way I used to always do. Now I rely more on myself for those kinds of things. And I guess just general life experiences – my best friend got married and has just recently had a baby. So, living vicariously through her doing that, I feel like I’ve just done that but I haven’t [laughs]. And the fact that people were so supportive of the last record, If I Want To, it gave me a bunch of confidence to continue making music that was really personal and music that I enjoy stretching the boundaries a little bit – having some gospel singers and some harmonica bluesy-sounding tracks. And, yeah, doing things a little bit differently. In terms of the personal stories, it’s confronting, I guess, to have your life in a song that’s not only performed in front of an audience but which is a permanent record of a state of mind that you were in at a particular time. Do you feel like it’s an act of courage, a lot of the time, to write songs that are so personal? I’ve always turned to music as a way of documenting how I feel. I always write every morning just about my dreams and how I feel that day. I like to express that and that’s the way I deal with it. So if people can also relate to those songs then that’s just the most amazing feeling – that the way I’m feeling is the way someone else is feeling – and it makes you feel like you belong, you know? That’s also an incredibly good creative practice, I would think, to be writing every day, because then you can draw on that material. Yes. A lot of it I just put into a little folder on my computer and think, Well, I’ll never use that, but sometimes you do come up with something that you wouldn’t have come up with unless you had kept writing – it just comes from writing about anything. I’m also curious about what music you’ve been listening to over the course of writing and recording this album. I listen to a bunch of different things, so that’s a good question. I have been going back to my roots, a little bit – I’ve been listening to stuff I used to listen to as a kid. You get a whole different perspective on it. So my mum would put on, like, Don McLean and Queen when I was a kid, so I’ve been listening to those things again – the classic-sounding songs that never go out of fashion. But I’ll kind of listen to anything and everything. So part of the reason why I asked was noticing that difference in your sound, and maturing of your sound, and the fact that you’ve just said ‘Queen’, for me is a clue because the way this album sounds is a bigger – not operatic sound but you do have these back-up singers, which is a bit surprising as you have an accomplished and big voice yourself, so I wouldn’t have thought you needed the reinforcement, but it makes sense to me now that those singers are there, that you have these layers of sound in the songs. The songs are big – high stakes. Yes – there are some big ideas topically. ‘Heartbeat’, the single, is about finally believing in yourself after struggling with which way you should go and listening to someone else’s opinions, finally celebrating who you are, and to me that’s a really big kind of idea and I wanted to back that up. And Luke Wooten, who produced the record, had a lot to do with the sound of the tracks. So, yes, I guess it does come with the dramatic ‘ta-da!’ kind of moments. So was it Luke or you who had the idea to have those backing singers on some of the tracks? They’re not on all of them. No, they’re not on all of them, and that’s a personal thing too because I feel like you should just sprinkle something special on a few different tracks. Luke has worked with them before and we actually had them on some of the tracks of the last record as well and I just loved them so much and they’re so fun. There’s just two – Angie and Gail are their names, two women who work together, and they just layer – they sound like a big choir. They’re flawless, the way they come in and just know exactly what to sing. It’s incredible to watch. And the way they talk – they snap their fingers and stuff when they talk, it’s really cool. So you went back to Luke for this album and in the interim Luke’s also worked with the Wolfe Brothers on their second album, so he’s obviously developing good relationships with Australian performers. But you to have a producer that you’ve worked with more than once, does he now feel like a collaborator? Yes, I feel it is like that, and I felt like that with the last record. Because when I go over there, I’m not actually over there for a super-long amount of time. I was there thirteen days for the last record and seventeen days for this record, so a lot of the stuff we’re doing is over Skype beforehand, talking about feels and stuff. So it has to come down to, yeah, I totally trust the way he thinks of a song and I’ll follow his direction for a song, unless I have a specific kind of thing in mind and then he’s very open to me having my opinions. So it feels like we’re doing it together. And there’s a lot of times when I’m tweaking lyrics of the songs up until I leave Nashville, and so it feels like I’m constantly writing the song and Luke has helped to do that up until the recording process is finished. In that amount of time there’s no room for playing, really – you have to arrive and hit your mark. Yes, it is like that. Vocals usually only take two or three days and band tracking takes two or three days as well, and then the rest of the time you’re re-listening to things and thinking about what should change, and then there’s backing singers who come in. So you don’t get to take it home and sit with it and drive around in your car with it – because I would never drive in America, my god, it’s on the other side of the road! I know people who have made their album over a six-month period and really lived with the songs but I kind of like doing all of that beforehand and then just going in there and letting the magic happen kind of quickly. I’m curious if the discipline of working that way, and having the time constraints that other acts don’t have, that’s good training for live performance, because there’s only the one shot there too. I feel like if I don’t have a deadline for something I’ll never do it. We knew that I was going to be recording in December in the middle of last year and I hadn’t written most of the songs yet, and it was just like, ‘Oh my god!’ And somehow magically it comes together. You think three weeks before that it’s just not going to but it does and I can’t even explain how it happens. But, yes, it is good practice doing it like that. For people who love a deadline there’s some mystical process around time and how time works and I think once you’ve got that deadline in sight it’s amazing how time organises itself to help you, in a way. It does, and things like ‘I need a song like this’ and it won’t come to you but the night before you leave, at 3 a.m., it will come to you. It is kind of magic in that way. And the songwriting process for this album – I don’t have notices about who you’ve written with, so if you wouldn’t mind talking a little bit about that. I did a three-week trip to Nashville to write the songs, and so I wrote about half here in Australia with some writers – Rob Draper, who I wrote ‘Rock ’n’ Roll Town’ with on the last record, we wrote a song called ‘We Don’t Know Any Other Way’ on this record. I wrote a song called ‘Fly Away’ on my own and it just kind of fell out at 3 a.m. I didn’t write anything on my own for the last record and it just kind of felt nice to have something that’s just very, very raw on there. ‘Eggs in a Basket’ I wrote in Australia with Clive Young. He’s great, he wrote ‘Last Man Standing’ with Adam Brand. That was our first time writing together and the fact that it’s called ‘Eggs in a Basket’ is the most random thing ever. ‘When I Found You’ I wrote with Joe, who plays piano in my band, and his songwriting partner, and we wrote it for my best friend’s wedding. We weren’t planning necessarily that that would be on the record but it ended up being that way, so that’s something very special. ‘Heartbeat’ I wrote overseas with some amazing writers over there. A lot of these people, it was my first time writing with them. And last year you did a few shows on Adam Brand’s tour? Yes, quite a few – it was about 21 shows. So that was in and around creating your own album. You didn’t write a song with Brandy but it can’t be far off. No, we didn’t write a song but there is a duet with Adam on this record that he actually put on his record, it’s called ‘Quit This Time’ and we performed it every night on this tour, so it kind of was so very much of the journey of the last couple of years so I wanted to include it on my album. It definitely the vibe that I was going for. But, no, we haven’t written so that would be good if we could do that. Maybe next time you’re on tour, although I think those long tours aren’t necessarily conducive to songwriting because you have other things to think about. Sometimes it is, but both people have to be in the mood because a lot of the time boys just want to play with their skateboards and drink beer and go to sleep, whereas I’m, like, ‘Let’s write a song’ and they say, ‘No, we’re not going to do that now’. So maybe eventually, but I might have to make a special trip. That’s a very good insight into the touring life. I know – they bring their skateboards and they skate around and it’s a lot of fun, but I didn’t even try it once. The closest I got to skating was sitting on my suitcase that had wheels and scooting myself along. It sounds like after soundcheck they’re off doing something like that while you’re studiously thinking, I could use this time. Yes, because it’s like, ‘You’re all such fantastic musicians, we should be getting together’, and also I’m thinking about making an album at the same time. But it’s nice, too, to kick back – I’m not always studious. But I guess I am a lot of the time. Your output over the previous years indicates that you’re productive, if not studious. I do like to be productive, but sometimes the best songwriting ideas come to you from letting loose and not thinking about songwriting. It’s a conversation with someone where you talk about life, so you can’t actually plan these things, I’ve learnt. Heartbeat is out now through ABC Music/Universal Music Australia. Melbourne performer Jasmine Rae has released the first single from her forthcoming album – and the single, ‘If I Want To’, shares its name with the album. I asked Jasmine about making the video clip for the song and whether or not it was strange to do something to different to writing and performing. Jasmine travelled to Nashville to write not only the single but other songs for this album. Not only do the songs come at different times and in different places, but they also come in different ways. When I asked if it’s lyrics or melody that usually comes through, Jasmine said, ‘Sometimes it’s just lyrical. It’s different every time, which is why this question’s hard! Sometimes I’ll get a pre-chorus or just the first line of a chorus. I wrote most of the lyrics for a song called “Just Don’t Ask Me How I Am” but in a poem form that I’d been chipping away at for months. So it happens differently every time, which I think is why I love it so much, and sometimes ideas that I think, “This is gold, this is it”, end up being completely nothing and an idea that I think, “I’ll just scribble that down even though it’s not the best”, ends up being the main song. If I Want To is Jasmine’s third album and it sounds as though the experiences for each of those albums have been quite different. ‘The first album – I’d won a competition called Telstra Road to Tamworth at the time, now called the Telstra Road to Discovery, and the date that my album was going to be released we already knew by the time I won the competition. So it was nine months of “We have to get this album out”. So there were a lot of songs that were picked for me that I didn’t get to write – they were great songs, but I didn’t get to write the whole album … and it was very much taking the advice of people because I was very green and we had a deadline. In between albums two and three, however, Jasmine’s life changed in a profound way: she took time off to care for her father, who had cancer, and he subsequently died. The album features a very moving track called ‘First Song’ and I took the opportunity to ask Jasmine about it, as it suddenly seemed as though it may well be about her father. Jasmine’s voice sounds different on this new album – not necessarily more mature, but there is a different tone to it. Given what happened in her life around the time of making the album, it seemed as though those experiences might be reflected in her voice. Since winning the Telstra Road to Tamworth in 2008, Jasmine Rae has become one of Australia’s most popular country music artists. Her debut album, Look it Up, was #3 on the ARIA Australian Artists Country Album chart and #20 in the overall ARIA charts, as well as being nominated for Best Country Albums at the ARIAs in 2009. Her latest album, Listen Here, has reached #1 on the ARIA Country chart and #5 in the overall chart. It has spawned the popular singles ‘I’ll Try Anything’ (with Joe Nichols), ‘I Faked It’ and ‘Hunky Country Boys’. The latest single is ‘Let it Be Me’ – to mark its release and on the eve of the 2011 ARIA Awards, for which she’s received another album nomination, we spoke to Jasmine and found an intelligent and grounded young woman who doesn’t take any of her success – or her fans – for granted. One of the reasons for this interview is your single ‘Let it Be Me’ so can you tell us about the song and why you chose it for the album? For this particular album I made a point of writing a whole lot more of the material on there. I had lots more songs to put on there and this particular song was written by Molly Reed and Nicolle Galyon but I fell in love with it. I loved it so much I pushed out songs that I wrote for the album just to put this one on there because it just says it so simply but it says it so beautifully. And it’s a little bit different from what I would normally perform, because normally I would write and perform songs that are edgy and more uptempo, and even if it’s a ballad then it might be a little bit sad, but this song is just very lovely and hopeful and I just wanted to put something out there that’s a little bit different and quite vulnerable. It is a bit sadder sounding than other songs on the album but you have that kind of deep voice – and by that I don’t mean in a lower register, but that your voice sounds like it’s coming from a place deep within you, so there’s that ability to be sad or to sound a little bit melancholy or wistful but also be a bit more raucous. Has that voice always been there or is it a recent thing? I’ve been writing poetry and songs since I was a little girl so I started off writing more poetic and, I suppose, metaphorical songs – I didn’t usually write songs that were so straight to the point. It’s since I’ve been touring around and performing that I’ve learned to love and learned to write songs that are more uptempo and really fun to do live with the band. But it was first that I was singing ballads and really strong lyrical songs, so it’s really nice to put that back in with what I’m doing and have it all kind of connect together, so you don’t have to just be a singer who sings just really party songs, you can be both, and I like that a lot. Well, maybe you could do more ballads on your next album, because they’re very nice! Oh, thank you. There were some extra tracks – a track called ‘Already Broken’ that I wrote with Sheree Austin that ended up being a bonus track for this album, and whenever you bought the ‘Hunky Country Boys’ single, it came with that. So there’s been quite a few ballads for this album that were ready to go and they were great, but I had to pick between them and I picked ‘Let it Be Me’ because it’s just such a beautiful song. What happens to those other songs that don’t get chosen? Do they see the light of day on the next album or the album after that, or are they just gone? It just really depends, and that’s kind of the hard thing about it. When you’re writing you hope that it’s going to get onto the album. There’s a secret track on this album that I actually wrote a very long time ago, called ‘Love is No Cure’, and I didn’t even sing it with music, I just wanted to tie it in with this album. But sometimes your songs can be sung by other people, or you can sing them a few years down the track, or it can just be a song that you sing live at your shows. But when they’re songs that you love you try to work them in with your other pieces of work, because you don’t want it to just be wasted. A lot of people who go to see music live regularly probably wonder how singers like you who have songs that you have to put in every set list don’t get bored singing the same thing. So do you ever think, ‘Oh no, not that again’? I got a little bit like that with ‘Country Singer’, but now the audience sings along with me, and I wrote that song on my own many years ago and then you can never really get bored, when they’re singing along and it’s something that you wrote, it’s actually like ‘I really love singing this song now’. It takes it to a different level. And every time you work with a new band or a new player, you kind of just mix up a different song in there. So I don’t really get bored too easily because I just find something else that’s really cool about the situation. You’re nominated for an ARIA in the Country Music category for Listen Here and you were also nominated for your first album, so I was wondering if that means you’re less nervous this time around. It does. Last year, to be honest, I was so scared, because it was very quick – I’d only just released the first album, and it was the next year but we had just finished touring it and it seemed like I wasn’t ready to make the new one, and [I was thinking] ‘Does this mean this is the closing chapter of the first album?’ and then ‘Oh my god, what if I win? I’m going to have to talk on TV!’ and all this stuff, and ‘Now I have to find a dress!’ And it was just so very scary, and I loved it but I was so scared. This time around, because this Listen Here album has been a long time coming – it’s been two years that I’ve been working on it – sifting through [songs] and only the cream of the crop got onto this album song-wise, and working with Mark Moffatt, and it’s one I’m really proud of, so when I found out I was nominated I wasn’t expecting it at all but I’m more excited this time, to celebrate something – just to be nominated is really good. And I’ve got the dress beforehand! Are you performing on the night? No, not this time – I would have loved to, but no. The only time I’ll be seen is on the red carpet, so hopefully I won’t fall over – fingers crossed – and if I win. It’s a competitive category – you have some stiff competition – but it’s a worthy nomination. I’m intrigued that you were listening to Kasey Chambers in sixth grade, because country music is usually not what a lot of primary school kids listen to, so have you been listening to it for a while? Yeah, I have. I live in the suburbs of Melbourne – I don’t live in the country at all –so I was the only kid, really, who listened to country music in primary school – and high school. So it’s always been something that I just love. I’ve listened to Dolly Parton since I was a little girl. I’m actually going to see her tonight. I’m so excited. I’ve never seen her live in concert. I know almost every song she’s ever put out. Even to people who aren’t musicians she’s just an awesome inspiration, just in her strength. I know! And she’s little. And I love that, because I’m little. I read some interviews making a bit of the fact that you’re little, and now you’ve mentioned it – is it something you’re conscious of? Well, Joe Nichols is massively tall by the look of him in your video [for ‘I’ll Try Anything’]. He’s actually not super, super tall – just really, really tall next to me! Growing up I was never really conscious of it. I’m more conscious of it now because so many country music artists are really tall. Brooks & Dunn are six-foot-four or something, and McAlister Kemp I perform with often and they’re the same – they’re so tall. So I notice it more now – I love it, it’s good. Finding clothes, you have to hack off the bottom so you make a headband that’s the same as the dress. I trip over less, because I have a lower centre of gravity. It’s good, I enjoy it – you can’t change it so you’d better like it, hey? Looking back over the sales of your albums and where you’ve charted, and you’ve done a lot of touring – from your perspective have you seen the sales and the sizes of your audiences growing the more you’re out on the road and connecting with people? Yes, I have. When I started – and I still feel like my audience could grow, that would be amazing – but when I first started I thought, ‘I’m not from the country, maybe these audiences are not going to like me’. And when I find them pouring in – you know, when I’m at the Gympie Muster and they’re just pouring in to watch me sing my songs and to sing along with me … Country music audiences are just amazing. They really do make you feel like you’re a success. I have no idea whether that means I actually am, but I feel like a success when they’re singing my stuff with me. It’s just so cool. Country music artists seem to really appreciate the connection with the audience – it is part of the show almost – you stay behind afterwards, you sign things, you talk to people. And when I get home I jump on Facebook to see what everyone thought of the show and before I go I jump on see if there are any last-minute requests before I go on stage. So it is very much a community and it makes you feel like you belong. It sounds a bit cheesy, doesn’t it? But I love it. Not at all – I think that’s part of its strength. Given the nature of country music and how big Australia is and how many places you go to, what is the most isolated place you’ve ever played? You can talk about that too! Hmmm … There have been a few places. I’ve been to Bunyip in WA, which is quite out of the way. My favourite venue is in Kuranda in Queensland, near Cairns, and it is kind of out of the way because you have to go up into a rainforest and it’s an outdoor amphitheatre in a rainforest. It is the coolest venue. But I’d like to get more remote. I’d like to go to the middle of Australia. Lee Kernaghan – I’ve travelled with him, and he did a lot of rural areas, but I’d like to do a whole lot more. That would be really awesome, to do that. You live in Melbourne, so what’s the country music scene like there? It’s growing slowly – or maybe my eyes are now more open to other people who like it, instead of just feeling like I was the only one. But it’s harder in Melbourne, to play country music – they’re slowly converting to it, but it takes a little while. The music industry’s really strong here – it’s got hip-hop and rock and funk, and country music is slowly growing, but it has been a bit of a struggle. A lot of people in cities watch CMC, so there are people who like it – hopefully there will be more gigs for them. This year we played Rod Laver Arena with Alan Jackson and the Forum with Joe Nichols and it was packed out, but it’s not as many gigs as I’d like. Jasmine, thanks so much for your time – and good luck at the ARIAs on the weekend.